Moonstone is a sodium potassium aluminium silicate. It is composed of two feldspar species, orthoclase and albite.It is found worldwide. 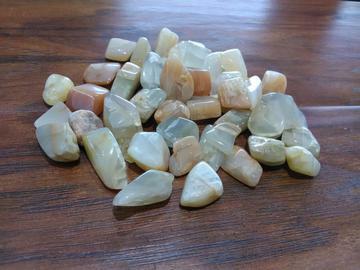 Moonstone is a stone of inner growth and strength. It soothes emotional instability and stress, and stabilises the emotions, providing calmness. Moonstone enhances intuition, promotes inspiration, success and good fortune in love and business matters.